Eyob is no stranger to exploring themes with a series of paintings, as witness his piece on the 9-11 catastrophe, the Falls of the Big Sioux River, or the evocation of sound. With his series on the Ark of the Covenant , however he may have come upon the kind of grand subject the cements reputations. The choice of The Ark of the Convenant as a subject seems especially appropriate to an Ethiopian emigre such as Eyob, since many people believe that the powerful religious artifact actually resides in Ethiopia. As well-schooled painter who is at home with both the objective and the abstract, Eyob is a completely capable of spontaneous subjective work. For his ark project, however, he hit the books and drew dozens of small-scale studies before setting paint to canvas. Many of the drawings on paper and cardboard --- Perhaps destined eventually to become collector's items them themselves--- show the evolution of an idea in attempt to reach its essence. Often he introduced design changes right up to the point of committing the concept to its finished form. The result, evident in canvases finished up to this writing, is spectacular, leaving viewers with the impression that Eyob has entered into a new realm. Take it from you friendly art guy; you must see the Eyob Mergia Ark of the Covenant Series, on view at the Warp & Weft rug shop at 8th andRailroad Center from May 6 through June 24. This show is, simply put, a knockout. Time will tell whether Eyob will enter the ranks of the immortals of art, but for now he assured thatSioux Falls is privileged to be the home of a prolific and vastly imaginative painter whose work is dramatic, engaging, and startling in its insight and in its sweep. Moreover, the theme of the show, the physical manifestation of the Almighty in the world, is one well suited to Eyob’s very satelity and spirituality. Just as his talent is unlimited by the conventions of concrete and abstract, the show ranges from almost shocking reality to powerful, amorphic suggestion, thought, and feeling. In individual panels, related works such as the parting of theRed Sea and its subsequent closing over the chariots of the pharaoh, and in multi-panel groupings that seem to expand exponentially, the artist is attempting to stretch toward the ineffable. However the result is ultimately judged, the effort must be seen as glorious. Man’s reach may exceed his grasp, but—in this world, anyway--- reaching is all. This article was written by Ron Robinson - etc magazine and was published on April 2005 Volume 4. Issue 5 . The painting is now on display in Piper's Custom's Framing and Art Decor. Exodus - an oil on canvas religious painting has been ceremonially inaugurated in Saint Meinard School of Theology in Indiana on Friday, October the 13th, 2006. 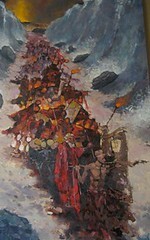 Exodus is a painting of the Israelites crossing the Red Sea on their way to Ca na’an as written in the Old Testament. 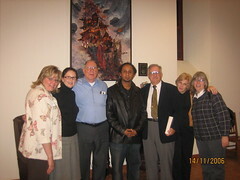 photo : St. Mainard - inauguration of Exodus with Reverend Damian, Eyob , Mr. Cornell , Mrs. Hodde and others. Exodus - an oil on canvas religious painting has been ceremonially inaugurated in the church of Saint Meinard in Indiana last Friday, october the 13th, 2006. Exodus is a painting of the Israelites crossing the Red Sea on their way to Ca na'an as written in the Old Testament. 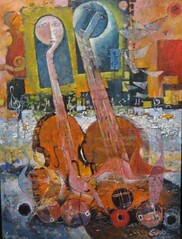 Eyob used his unique brush stroke and composition skills he acquired from his exposure to traditional ethiopian art. This painting is part of the series of paintings for the Ark of the Covenant project in 2005. In this project, Eyob will be blending traditional ethiopian art with modern art. Many researchers have studied and written about the mystery and story of the Ark of the Covenant and Eyob will be trying to discover it with art - to discover the invisible. Graham Hancock has written a best selling book- The Sign and the Seal on the mystery of the Ark of the Covenant and its history in the ancient Ethiopian Orthodox Church. Other paintings of the Ark of the Covenant series can be seen in religious paintings and religious drawings.